More and more people use their smartphones to wake up in the morning. And if you’re one of them, chances are it’s affecting your sleep at night. Late at night, we find ourselves scrolling through our timelines, while the blue light affects our natural ability to sleep. Circa aims to change that. The stand-alone smart alarm clock secured 50% of it’s 100.000 euro funding goal on Kickstarter after a week. 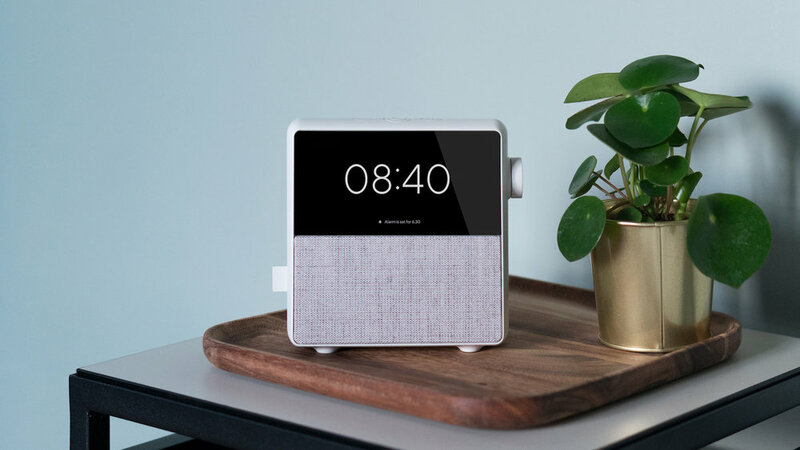 Circa, a beautifully designed alarm clock by Circa Labs and Dutch designer Robert Bronwasser, helps you to fall asleep at night and wakes you up at the right time the next morning. It embodies a range of smart sleep features to make sure you get the sleep you need. With the smartphone and the rise of smart assistants, we got the question why we would make an alarm clock in 2017. But with the distractions that the phone provides and the privacy challenges of having microphones and cameras in the bedroom, we think that there is still room for technology that does one thing very well, in our case helping you sleep better! In the evening, white noise, calming sounds or breathing exercises can help you to slow your breath and thoughts before drifting away. At night, Circa’s display is dark by default, only showing the time when you need it. Circa features a thin sensor underneath your mattress that measures movement and respiration to understand your sleep cycles. Your average alarm clock wakes you up at a fixed time every day, whether you are in a deep or light sleep. In a timeframe of 30 minutes before your alarm is set, Circa’s smart alarm will find the best moment to wake you up in light sleep, making you feel more refreshed in the morning. To improve your sleep routine, Circa provides you with insights based on multiple nights. Instead of an arbitrary “sleep quality score”, it helps you to adjust your schedule to get the most out of your night. All information is stored and processed locally on the device. Wake up with a wide selection of beautiful alarm sounds or listen to your favorite stations and playlists on Spotify or digital radio. For a fully soothing wake-up experience you can connect Circa with your connected lights or thermostat to slowly light up your room or make your home comfortable before the alarm goes off. The only thing you have left to do is turning on your coffee maker. Circa launched on Kickstarter on the 9th of November and comes in three colors. Pricing for a single unit including sensor starts at €159.